If you've been around the sport for a few years you'll likley be familiar with the name of Louise Collins. Louise was a very talented Age-Group triathlete, finishing second (overall) at Ironman Lanzarote, winning The Vitruvian and - in only her second Ironman race - winning the F25-29 division at the 2010 Ironman World Championships in Hawaii (read her report from that HERE). If you search the Tri247 archives, you'll find plenty of other superb results we could also mention. From conquering the heights of long distance triathlon, in recent years Lou has been focussing on cycling - and in a format that couldn't be much further from her Ironman roots! 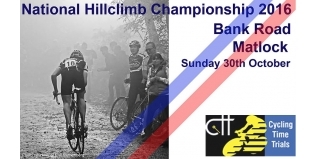 Cycling hill climbs are typically short, but exceptionally painful... and on Sunday Louise (under her married name of Louise Bates), won the RTTC National Hill Climb Championship in Matlock. No need for energy gels and bento boxes in this format of racing. It's ultra-light bikes and races often won and lost by tenth's of seconds rather than minutes. Lou pictured below with her Age-Group winning Umeke in Kona six years ago.